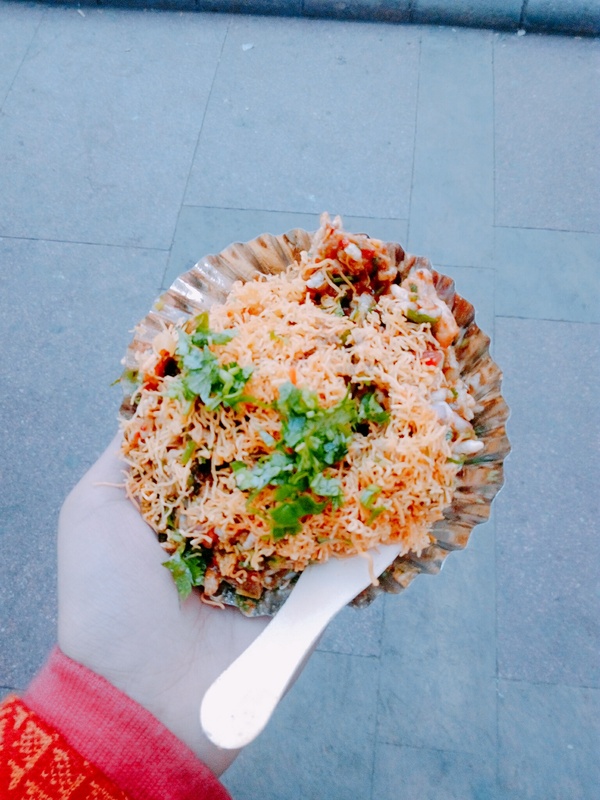 The Iconic Lutyens’ Delhi- Connaught Place is every foodie’s delight. The rightly nick-named as heart of Delhi, it lives up to its reputation of having something for everyone- rich or poor. The high ceilings and numerous building with bold white pillars, standing the same since so many years are one of the best spots to hangout at. With all types of shopping brands for locals, you will often bump into many foreigners. As old as this area is, some classic shops have patrons and many come back for these classics. One can fine-dine at plenty of spots here, enjoy fast food at many small cafes and burger-places, or enjoy the winter delights like shakkar-kandi aur amrak (sweet potato and star fruit), adrak wali chai (ginger tea) served by local vendors. One such place is the Odeon Bhelpuri Bhandar. A small kiosk, set up right opposite the much frequented Odeon Complex.It is now owned by his father Anil Kumar and was set up in 1965 by the late grandfather of Nikhil Kumar. There are three things on the menu- Bhelpuri, Sevpuri and Jhalmuri. Now, what is so special about it? The answer has to be everything! From the secret spice mix to the imli chutney which has khajoor (dates), puffed rice, freshly cut tomatoes, chillies, onion and generous amount of coriander and topped off with a layer of sev. One just cannot go wrong with it. The recipe and taste of each of the snacks have been constant for the past 52 years. The owner’s father went to Bombay to learn how to make bhelpuri and then went to Calcutta to learn Jhalmuri. It is the 3rd generation which is handling the kiosk now and loves doing it. He starts selling the deliciousness from 1pm and stays until 11pm every day.